View More In Network Antennas. The antenna operates in both the 2.4-GHz and 5-GHz frequency bands and is designed for use with Cisco Aironet 2.4-GHz and 5-GHz radio products that have dual-band reverse-polarity TNC (RP-TNC) antenna ports. The antenna has a nominal gain of 2 dBi in the 2.4-GHz frequency band and 4 dBi in the 5-GHz frequency band. Operating frequency range 2400 to 2500 MHz 5150 to 5850 MHz Nominal input impedance 50 Ohms VSWR Less than 2:1 Peak Gain @ 2.4. GHz 2 dBi Peak Gain @ 5 GHz 4 dBi Elevation plane 3dB beamwidth @2.4 GHz 63 degrees Elevation plane 3dB beamwidth @ 5 GHz 39 degrees Connector type RP-TNC plug Antenna length 6.63 in. (168.5 mm) Antenna width 0.83 in (21 mm) Radome length 4.88 in. 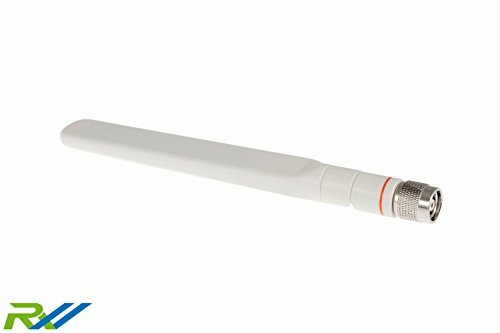 (124 mm) Weight 1.3 oz Operating temperature -20°C to 60°C (-4° to 140°F) Storage temperature -40°C to 85°C (-40°F to 185°F) Environment Indoor, office System Requirements: This antenna is designed for use with Cisco Aironet access points that support simultaneous operation in the 2.4 GHz band and the 5 GHz band and that have dual-band antenna ports, labeled as such in orange text. Installation Instructions: Step 1 Verify that the connector to which you are connecting the antenna is a dual-band antenna port, identified by orange text on the access point. Step 2 Align the antenna connector with the RP-TNC connector on the access point. Step 3 Engage the antenna connector threads with the RP-TNC connector on the access point. Step 4 Tighten the antenna by hand. Do not use a wrench or any other tool to tighten the antenna. Step 5 Adjust the antenna's articulating joint to the desired position. If you have any questions about this product by RoutersWholesale, contact us by completing and submitting the form below. If you are looking for a specif part number, please include it with your message.